Clinical guidelines are theoretically very useful, gathering leading experts to help front-line clinicians care for patients. Experts often spend decades doing research into a single clinical problem. Clinicians, on the other hand deal with a multitude of problems. A general practitioner may deal with cancer, heart disease, and obstetrical problems all in the space of 1 hour. 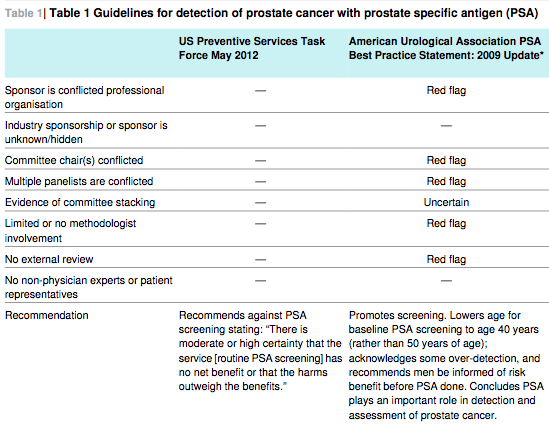 So guidelines should serve to document ‘best practices’ and become a standard of care. Good guidelines identify and disseminate the most scientifically sound advice available. Thus it is extremely important to monitor the integrity of the guidelines. 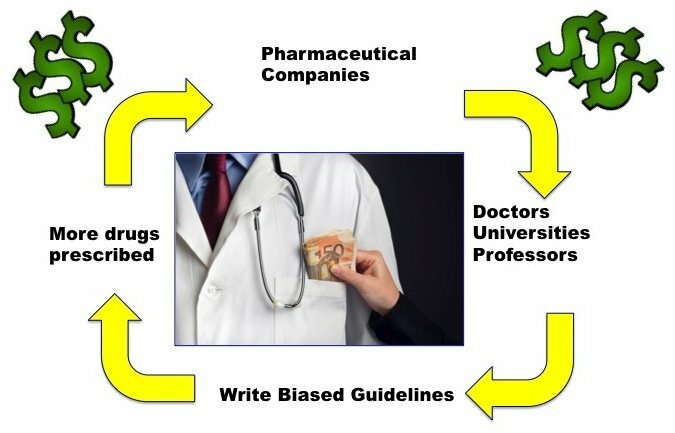 Financial conflicts of interest (COI) among authors and sponsors of guidelines has the potential to turn these guidelines into nothing more than marketing tools for drugs and other devices. It is already well known these financial COI are extremely common among doctors and considered both widespread and acceptable. Biased guidelines harm patients by exposing them to medications unnecessarily, and puts other physicians in a dilemma, because they may be accused of falling short of the standard of care if they do not follow accepted guidelines. There are many ways that Big Pharma pays doctors. The more prominent the status of a doctor, the more likely he/she has been paid off. The most common are speaker’s fees and consulting fees. In the former, a pharmacy company will pay a doctor to deliver a canned talk (one that is written almost entirely by the pharmaceutical company) to an audience of other physicians. It is purely advertising, for which the doctor is usually paid $1500 – $2000. Not bad for an hour’s work, considering that he/she did not have to think about the lecture, write the slides or even know what needed to be said. The second form of graft is consulting fees. The company will pay the doctor for his/her ‘advice’ as a consultant on how to market a drug. Of course, the company cares not at all about what he/she says. It is an opportunity to give these doctors a 2 hour advertisement disguised as a consultation. For this the doctor is paid $2000-$5000. It is no different than those free tickets you can get for sitting through some high pressure sales pitch from the time share company near Orlando. But doctors love these, because they are lucrative, and they get to listen to some drug rep tell them over and over how smart they are, and how influential. Flattery will get you everywhere. The most insidious form of corruption is ‘research’ money. While it sounds great, it is usually another thinly disguised form of bribery. Some research project is usually set up with little or no academic merit. The universities setting this up are well paid. The doctors who participate are well paid. Best of all, research meetings are held regularly in lovely locations like Vienna and Hawaii. ‘Researchers’, of course, are invited to participate, all expenses paid. The public only sees that the company has donated ‘research’ money and that the doctor is doing ‘research’. These shenanigans happen every day, in every university. If you’ve ever wondered why there is so much money being raised for heart disease or cancer or diabetes, and why there is so little real medical progress – this is the reason. It is estimated that 80% of research studies are cited less than 10 times. That is the number of times another researcher had read the research and thought it was important enough to reference it. Less than 10 times means that only the authors themselves had even bothered to read it. Imagine that your local neighbourhood planning office was led by a man who was receiving kickbacks from drug dealers. Now a dictum comes out that ‘Crack houses, grow ops and protection of dealers is great! Let’s get some more’. Would that be acceptable? We have names for this kind of behaviour. Kickbacks, bribes, corruption, graft. In medicine, we call it ‘acceptable, widespread and welcomed’. In both cases, there is a clear financial conflict of interest, and both cases are completely unacceptable because committee members have a fiduciary duty to protect the interests of its group, and must be free of financial COI. Doctors also have a fiduciary duty to protect the public health, but it seems that nobody takes this COI very seriously. A survey found that 71% of clinical policy committee chairs and 91% of committee co-chairs had financial COI! Since these leaders determine who sits on the committee it is no surprise that “what is to be decided (by committees producing guidelines) is often already decided by with the selection of the deciders”. That is, if you stack the committee with people who love drug treatments, then the guideline will reflect this, even if the individual committee members are not complicit. Converting raw data into clinical recommendations requires the use of subjective judgement, so it is vital that people are unbiased. As of 2011, 130 guidelines were reviewed to see how many complied with 18 of 25 Institute of Medicine standards. We’re not looking for perfection here. The median number of IOM standards (out of 18) was only 8. F***. That’s 44.4%. An ‘F’ grade for sure. Most guidelines written today are not worth the paper they’re written on. 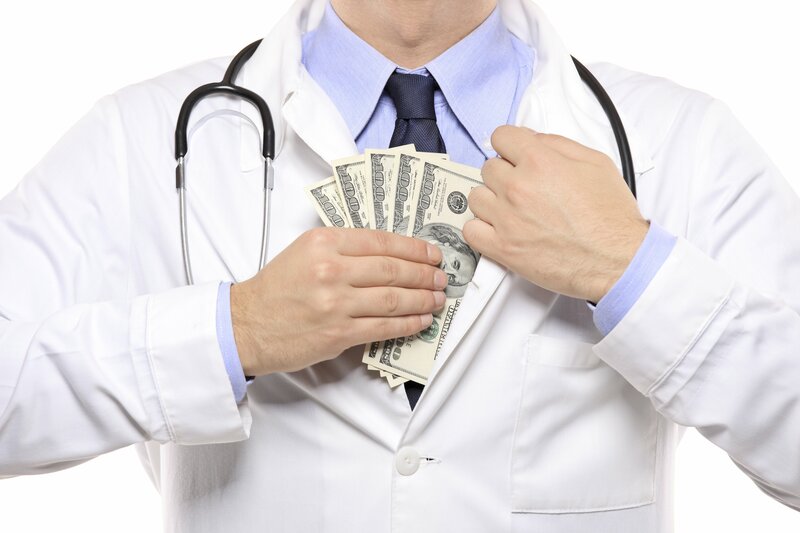 Much evidence exists that financial COI influences doctors perceptions about medications. That’s no surprise. Doctors are human and as prone to advertising as anybody else. But doctors do not acknowledge that these financial COI plays any role in their medical decision making, when it is obvious and well proven that this is true. Good evidence exists that guidelines play a key role in promoting MORE care, but not BETTER care. Guidelines are better thought of as marketing materials rather than road maps to improved medical care. This stems directly from the root corruption of the people writing these tainted reports that now guide all of clinical medicine. 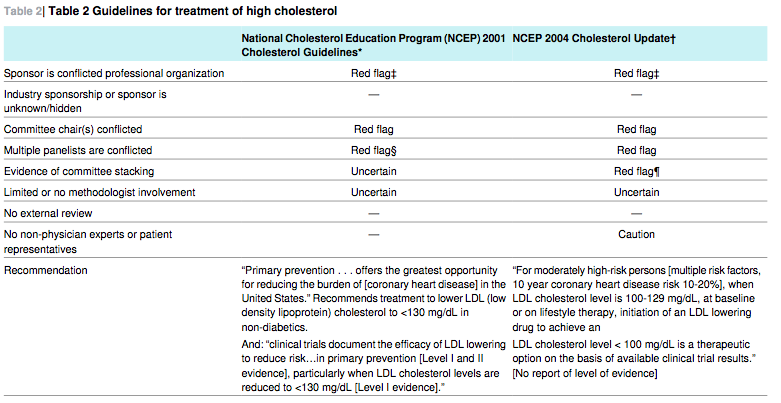 In another example, the National Cholesterol Education Program (NCEP) cholesterol guidelines update in 2004 considered 3 studies on primary prevention published since the 2001 update. The ALLHAT study showed no benefits to statin medications in primary prevention. The PROSPER study showed that elderly people (>70 years) without evidence of disease showed no benefits from statins. The ASCOT study showed no benefit in primary prevention in women. 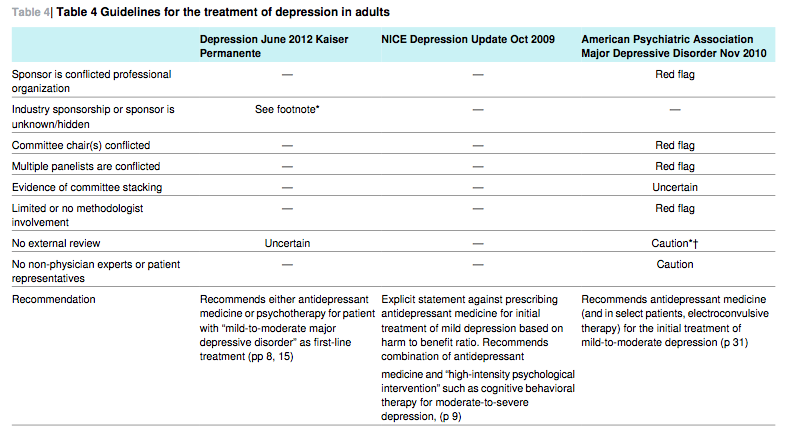 Yet still, the NCEP 2004 update greatly expanded the indication for statin treatment. WTF??? All becomes clear when looking at who wrote the biased guidelines. It appears that when companies pay doctors a lot of $$$, they write nice things about who should be given drugs, making more $$$ for the company. In 2001, all 14 of the committee members had financial COI. In 2004, 8 of 9 (89%) of members had COI. Nice….For doctors and big Pharma, it’s a win-win situation. Doctors make more money, Big Pharma makes more money. Who loses? Everybody else. More patients take more drugs that don’t make them healthier, but expose them unnecessarily to side effects. Just recently, the American College of Cardiology (ACC) released new guidelines lowering the definition of high blood pressure to 130/80. This immediately makes over half of Americans defined as having high blood pressure. While the committee was relatively free of COI, it was not noted that on average, each editor of the Journal of the American College of Cardiology (JACC) received $475,072 in 2014 from Big Pharma. Who made this change? Oh, right. The ACC. Where was it published? Oh, right. JACC. The fact that millions more patients would be looking at starting new medications for the newly diagnosed ‘high blood pressure’ surely did not escape the notice of those pharmaceutical companies paying off the editors. The reason there is so little public trust in doctors is really quite simple. We’re not that trustworthy. A few bad apples are destroying our reputation. It’s time to end the graft. The solution is very simple. If you write a guideline – neither your organization nor any individuals should be taking drug money. This is already true in virtually every other sphere of public service. We don’t allow politicians to take kickbacks. Why don’t allow government employees to take kickbacks. We don’t allow school boards to take kickbacks. Why allow doctors, universities and professors? Has anyone looked at the DGAC’s current financial COI? I’d be fired and maybe prosecuted if I behaved in this way. The standards in medicine are far below those expected in far less important jobs. Thank goodness for doctors like Dr Fung, Kendrick, Hallberg and all the others. The internet, for all its faults, gives us a chance to hear and learn from such people. I agree. Thank goodness for the likes of Dr. Fung, Dr. Tim Noakes, Gary Taubes, Nina Teicholz, Dr. Michael Eades, Dr. Campbell-Mcbride, et.el. I don’t think people know the risks these people have taken, and the amount of ridicule they have received from their “peers”. They truly are heroes. An excellent list, Kurt. These people have done much more for public health than most people who we pay to help us and often do the opposite. I’m grateful to them. I’d add sane and brave people in nutrition – Zoe Harcombe, Caryn Zinn and Trudi Deacon. Not easy in a field that persecutes people who make their patients better ‘inappropriately’. I’d like to add Dr Gary Fettke from Tasmania, Australia to that list. He has been sanctioned for giving low carb nutrition advise to his diabetic patients in an effort to avoid amputating their feet. He has since been told that if he speaks of nutrition to his patients, or publically, he will lose his license to practice medicine. He has chosen to ignore the sanction. Go Dr Fettke! Spot on, Lilly. I shouldn’t have forgotten him. The list is getting longer! Dr. Jason Fung is definitely Canada’s top doctor. He should be minister of health for Canada. By my calculations of his educational history, Dr. Jason Fung was a genuine child prodigy. Eventually it will be obvious that he is the best of the lot. He is just now getting traction and will be accelerating his impact on society. Jason Fung and Aseem Mahltora are such plagiarists really not even preaching their own thoughts… social and media, money-makers these men are they are a part of the very practice they are attempting to expose themselves! Do you have criticism of the science? People interested in money would find it a lot easier taking it from pharma. These doctors take on a failed but profitable orthodoxy and get thanks only from the public. No one gives a S— whether they are plagiarist or not, and no one gives S— what you think. I had the exact same thoughts 40 years ago that Jason Fung is having now, but I don’t fault him. You find fault because you still have your lips super-glued to the rear-ends of the medical profession and still haven’t realized that modern medicine is at least as destructive as either Nazism or communism. Ignore this account, this is either a bot or a pharma-funded negative comment. zzzzz….zzzzz….zzzzzz…..ignore. Dr Fung and others with true courage of their convictions are single-handedly changing people’s lives for the better. I hope your doctors don’t over treat you because you could die. People are dying. If you give an old person too much medicine they die. If you drive down the blood pressure too low, old people fall and break their bones. The elderly and the young are being over medicated. Some of these drugs can make them suicidal. People are getting brain damage from drugs. People are hooked on pain killers. Wow. Thanks for posting this. I’m shocked. The problem is putting everything in the same category. I agree that homepathy isn’t remotely credible, but there’s good reason to question the ever growing list of vaccinations and the refusal to look at the results. A real analysis of vaccinated and unvaccinated children would answer the question, and the data is probably available now, but there is an absolute determination to prevent this happening. Why? Pharma already knows the answer. Great Summary of the ongoing lethal corruption. What about “further education” of doctors. I saw that in Sweden typically 80% was arranged by the medical practice/hospital in question and 20% direct by pharma industry. But is the industry also “sponsoring” the “further education” provided by medical practices/hospitals, for instance with materials, talks, and videos? Anybody knows? I love you, Dr. Fung. “The reason there is so little public trust in doctors is really quite simple. We’re not that trustworthy.” It must be very painful and discouraging for Dr. Fung to realize (recently) what I and many other people have realized for 45 freaking years. Of course we did not know the details of the corruption. Dr. Fung, one of the few people in North America who deserve the title “Doctor”, is providing a tremendous public service. I am surprised he still has his license and/or his life. Do you still worship at the Altar of Modern Medicine? This is an excellent post. Many of the issues raised about Big Pharma reinforce why we need Vanessa’s Law (Protecting Canadians from Unsafe Drugs Act) to be enforced. It became a federal law in 2014 but has to be implemented by Health Canada. I forgot to add that I have lost 25 pounds in 11 months by using a combination of HFLC dieting and a daily 16/8 fasting regimen. This was all possible because this kind of regimen completely eliminates hunger pangs while providing ample energy from the moment I wake up. I also eliminated all my medications that I had been on for 40 years.